It’s Christmas, which means that party season is officially here. This year, it’s all about bold colours, definition, and glitter, so try these hot trends as you prepare to party the night away. It’ s all about dark, bold colours this year, so bring out your inner vamp with Max Factors new range of gothic colours from their Glossfinity range. Glam it up in Royal Blue, Aqua Marine, Amethyst or my personal favourite Burgundy Crush. 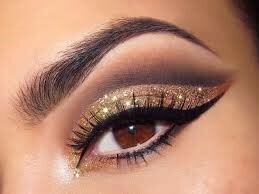 Get this gre at look with Maybelline Eyestudio Colour Tattoo 24hr Cream Gel Eyeshadow in gold. Dab it on with your finger, bringing it just to your brow bone before gently patting glitter over the top using an eyeshadow brush. Finish off with a jet-black Kohl eyeliner and a generous amount of mascara. Go bold wit h your lip colour this season. Apply a stain first, then follow with a dusting of translucent powder. This avoids the need to constantly reapply your lip colour. Then, just finish with a lip colour a shade darker than the stain to add dimension. 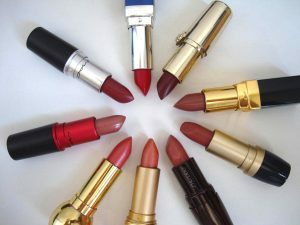 Try Urban Decay’s range of Revolution Lipsticks. Top knots look great and are so easy to do. Placement is key though, so go high for a truly great look. Use hairspray to prevent flyaways and bobby pins to keep it in place. Also, make sure to use a texturizing shampoo to prevent your top knot from falling, which will happen if you hair is too silky.